For maintaining payroll account you have to create Employee Category. There is two type of Employee Category can be create in Tally. Go to Gateway of Tally - Payroll Info - Employee Categories - Create (Under Single Category). Specify the name of the category to be added in the name field. Set the option Allocate revenue Items to Yes to allocate revenue related transactions values for employees created under this category. Set the option Allocate Non - Revenue Items to Yes to allocate non revenue related transactions values for employees created under this category. Press Enter to Save the employee Category. Press F12 to add/ remove options to Employees Category Creation Screen. Set the option allow ALIASES along with the name to yes. Set te option Language Aliases along with names to Yes to add the names in other languages other wise set to No. Set the option Allow Advanced enties in Master to Yes. 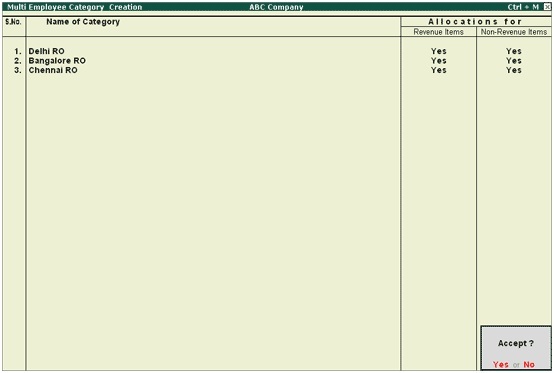 Enable the options Allocations for Revenue Items and Non Revenue Items, if required. A Payroll unit is similar to Unit of Measures used in the Inventory Module. 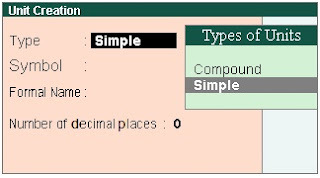 Tally.ERP9 uses payroll units to calculate pay components for a given period. You can create Simple and Compound payroll units depends, measured on attendance/ production types such as Time, Work, or Quantity. 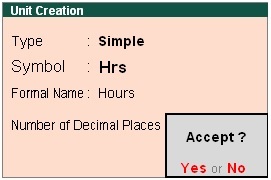 Similarly, you can create the other Payroll Units such as Minutes, Hours and Pieces etc. In a compound unit you can combine two payroll units. For Example, a box of 10 Nos, a dozon of 12 Pcs, and an hour of 60 Min. Specify the conversion factor in the Conversion Field. In this Example, the conversion factor is 60. Specify the Second Unit from the Units List. In this Example, Mins is the Second Unit. Press Enter to save the compount payroll unit creation screen. Note: By default, Tally.ERP9 contains four preset Calculation Periods - Day, Fornights, Months and Weeks. However, you can add new payroll units Based on your business needs.